The persistent rise in lithium spot prices from 2014 to 2016 has prompted an Australian company to formalise its agreement with a local exploration outfit, to look for richer lithium deposits in a known mineralisation zone south and east of Karibib. Australian mining firm Auroch Minerals, this week via the Australian Stock Exhange, said it has exercised its option to acquire 90% of EPL 5751 as it continues its focus on the Karibib lithium project in Namibia. The company, said it will be moving into a full joint venture with Namibian firm, Dynamic Geo-Consulting Services, which is the registered holder of EPL 5751 near the town of Karibib in the Erongo region. “The new JV is an important step in the growth of the Karibib lithium project as we continue to grow the company’s Namibia portfolio. Although exploration is still at an early stage we have identified substantial Lithium mineralised pegmatites across the license and will continue to focus our field efforts in this area,” he added. Litium, while not rate, has never been mined in large quantities but with the advent of electric cars, the demand for lithium has surged. It is used to manufacture the new generation electric car batteries. According to the Auroch statement, EPL 5751 contains four historical pegmatite occurrences, the Tsaobis, Nordenburg, Dorstriver and Villa Rosa pegmatites. The company said field visits to date by Auroch geologists have revealed lithium mineralisation is present at Tsaobis. According to Auroch, samples assaying up to 2.73% lithium oxide have been collected during first pass reconnaissance field work. Auroch said that the presence of lithiophilite in the Tsaobis pegmatite is also confirmation of lithium enrichment and that the pegmatite is a lithium caesium tantalum pegmatite and is highly prospective. 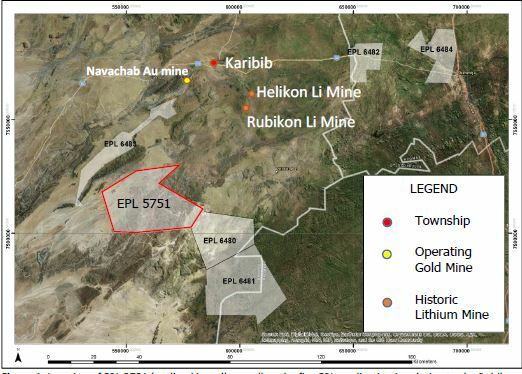 Meanwhile, the terms of the Option and JV when the transfer of EPL 5751 is completed and registered, say that Auroch will pay Dynamic Geo-Consulting US$20,000 and issue them 100,000 fully paid ordinary Auroch shares. According to the agreement Auroch will be funding all expenditure until there is a positive feasibility study that supports a decision to mine. Auroch will also be the manager of the joint venture and determine in its absolute discretion the JV programmes and budgets for work to be carried out on the project. Furthermore, the Australian firm stated it may elect at any time to withdraw from the joint venture upon which the project will be returned to Dynamic Geo-Consulting and Auroch will have no further liability, other than remedial obligations relating to activities carried out under the agreement. The Australian firm stated that it is in a strong financial position to continue with the joing venture listing cash and other liquid assets of A$ 8.3 million. PreviousWho will be the next millionaire?